Today is the start of Week 33 in the quest to read 52 books in 52 weeks and should have you starting book # 34. 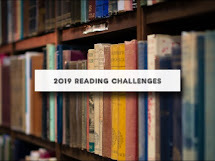 We are two-thirds of the way through the year and towards our goal of reading 52 books for the year. These days there are awards for every different genre and category of book. 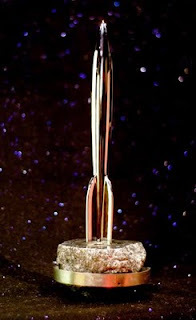 The award for excellence in science fiction and fantasy is the Hugo Award. The 2009 Winner for the best novel is a book I'm sure most of us have heard of or read by now. His competition was Cory Doctorow's "Little Brother," Neal Stephenson's "Anathem," Charles Stross's "Saturn's Children," and John Scalzi's "Zoe's Tale." 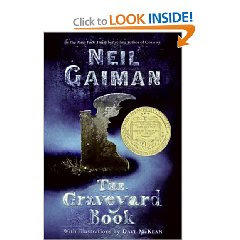 The only one I've read is Gaiman's so I have some catching up to do. The very first Hugo awards were awarded in 1953 and the toastmaster was Isaac Asimov. 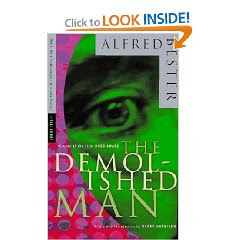 The best novel award went to Alfred Bester for "The Demolished Man." "The citizens of the planet Lithia are some of the most ethical sentient beings Father Ramon Ruiz-Sanchez has ever encountered. True, they have no literature, no fine arts, and don't understand the concept of recreation, but neither do they understand the concepts of greed, envy, lust, or any of the sins and vices that plague humankind. Their world seems darned near perfect. And that is just what disturbs the good Father. 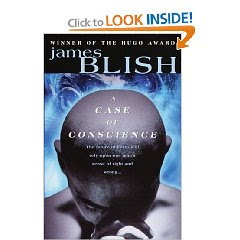 First published in 1959, James Blish's Hugo Award-winning A Case of Conscience is science fiction at its very best: a fast-paced, intelligent story that offers plenty of action while at the same time explores complex questions of values and ethics. In this case, Blish has taken on the age-old battle of good vs. evil. Lithia poses a theological question that lies at the heart of this book: is God necessary for a moral society? The Lithians are nothing if not moral. Not only do they lack the seven deadly sins, they also lack original sin. And without any sort of religious framework, they have created the Christian ideal world, one that humans would be eager to study and emulate. But is it too perfect? Is it in fact, as Father Ruiz-Sanchez suspects, the work of The Adversary? And what role does Egtverchi, the young Lithian raised on Earth, play? Is he an innocent victim of circumstance, or will he bring about the Dies Irae, the day of the wrath of God, upon the earth? The fate of two worlds hinges on the answers to these questions, and will lead to an ancient earth heresy that shakes the Jesuit priest's beliefs to their very core. A Case of Conscience is a brilliant piece of storytelling, and it packs a lot into a scant 242 pages. Most readers will probably finish the book in one sitting, unable to stop until the spectacular denouement. But the questions posed by this little-known gem will stay with you for days afterward. --P.M. Atterberry "
Intriguing! I think I feel a challenge coming on.